"Indulge yourself like royalty with our King of Pilsners personalized beer glass. Made with the fetching taper of classic pilsner beer glasses, each one comes custom engraved with a crown atop the single initial and name of your choice. 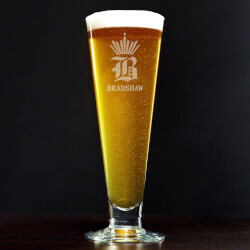 This grand personalized beer glass features an impressive 9 height with a round glass foot to prevent spills. These beer pilsners will surely make a memorable gift to any beer lover, or in any home bar. Holding a full 16 oz of beer, hand washing is recommended.Made of premium glass with a traditional taperPersonalized with the name and single initial of your choiceMeasures 9 tall with 2.75"" diameter; holds 16 ouncesHand wash recommended"